In the above example, it appears you are drawing a line. The line is produced by connecting the previous mouse position (from the previous run of draw) indicated by pMouseX and pMouseY with a line that connects to the current mouse position mouseX and mouseY. 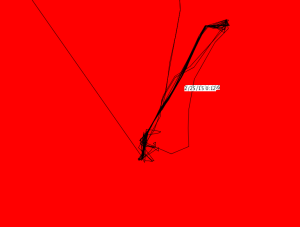 In this way we are connecting all of our mouse positions with tiny little lines. We want to do the same in with our map locations. We want to store the previous map latitude and longitude in variables ppLocationsX, ppLocationsY; And then draw a line from this previous location to the current location as pulled from our table using the variable currentRow. In this way we can animate our path. //When current row is 1, we refresh our map tiles. //pass the location to the posLocations object. //if at end of table, go back to the start. How would you display the date label for the current location? How could you display all the data on the map but highlight and animate the current location with color and/or an avatar? Here is another example of animating a date label.